A firefighter works a smoldering âhot spotâ on the Red Table Fire on Friday afternoon. EAGLE — Firefighting crews are reporting nearly 100 percent containment of the Red Table Fire, and Colorado Parks and Wildlife is resuming normal operations at Sylvan Lake State Park. Visitors are invited to enjoy a variety of day-use and overnight activities, including hiking, fishing, boating and camping. 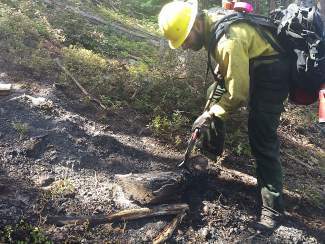 On Wednesday afternoon, park rangers from Sylvan Lake State Park reported a column of smoke rising from the forest, approximately 1.5 miles southwest of the park. Using the park’s lake as the location of their incident command and staging area, fire crews aggressively attacked the 20-acre fire with helicopters, aircraft and over 100 firefighters, bringing the fire under control over the weekend. Although the fire did not threaten the park at any time, park managers temporarily closed the areas around the lake to day-use due to the heavy presence of firefighting equipment and personnel.